This incredibly popular outdoor activity appears relatively new, but actually, people have likely been practicing it since time began. Perhaps you have simply heard the term or maybe you have got as far as seeing a few photographs, in which case you'd be forgiven for thinking the activity simply involves throwing yourself (safely) off coastal rocks, into the sea. Honestly, there is more to it. The great thing about our coastline around much of the UK, is that it isn't the one long flat sandy beach you'd see in an Indian Ocean holiday brochure. The kite buggy enthusiasts may prefer this, but once you have a go at coasteering, you'll be thanking our seas for being so temperamental and destructive. A normal coastal walk would take you on a path, usually up on the cliffs, and staying mostly away from the edge. Coasteering embraces the edge! Coasteering is where you make you way along a stretch of coastline either by foot, or by swimming, clambering over rock pools, scrambling up cliffs faces, and swimming around sections of inaccessible headland. It is about experiencing, and moving along the zone between land and sea under your own power, without the aid of a boat, raft or canoe. While the activity is not something anyone in their right mind would attempt on their own, as an organised and guided group activity, it can be perfectly safe without losing any of the excitement. The commercial opportunities for this coastal activity have now been fully recognised, and backed by the Adventure Licensing Authority. This government approved body, who seek to ensure the safety of activities through a licensing scheme, currently approve the coasteering programmes offered by 215 companies and organisations, throughout the UK. A full list of these providers can be found on their website. Where can you go coasteering? There are approved activity centres offering the activity up and down the country, but a definite concentration on the rocky Pembrokeshire coast. An area unofficially seen as the home of coasteering. Not including safety equipment, which will be provided by the provider, the basic kit list includes a wet suit, a buoyancy aid, a safety helmet, and an old pair of trainers. Most centres will provide all but the trainers, so it is not an activity that requires a big outlay to take part, which is part of what makes it so inclusive and popular. Prices do vary, but as an adult you would expect to pay around £60 for a half day experience, and £100 for a full day of coasteering. Less if you take part during a residential activity courses. A good question as the size of the market will have a bearing upon how likely you are going to be able to find employment as a coasteering guide. Although the lack of a governing body (we'll come to that in a moment) makes it difficult to find exact figures, it is estimated that there are in the region of 120,000 coasteering trips taken every year in the UK. 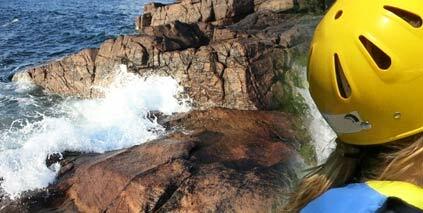 Want to become a coasteering instructor or guide? Being relatively new, the activity is not as established as many other adventure activities. And as we type, there is not yet any officially recognised National Governing Body (NGB) for coasteering. This means that there is no official course that everybody who wants to become a coasteering guide will take, but there are still ways of getting involved. One organisation that sought to take ownership was the British Coasteering Federation, or BCF. Their BCF Guides Scheme was an initiative seeking to establish best practice through the training of qualified guides. They still list on their website the phone numbers and email addresses of around one hundred people who completed their courses, but they no longer exist. An alternative body that is currently active, is the International Coasteering Association (ICA). Run by an adventure company called EBO Adventure, their coasteering instructor training course requires a recognised life saving award such as the Surf Life Saving GB or NARS Beach Lifeguard award, and covers everything from group management to route planning, though obviously with a heavy emphasis on safety such as first aid and risk management! Another attempt to take ownership came in 2010, with the establishment of the National Coasteering Charter (NCC), and the idea of creating national and minimum operating standards. They have quite a few operator members and most importantly are backed by AALA and the RNLI. While the NCC do not offer coasteering guide training courses directly, some of their members do offer guiding and skills courses. Take a look at Lizard Adventure, and Vertical Descents. These new qualifications from UK Canyon Guides look challenging but will give you the ropework, climbing and water safety skills required to take groups on guided gorge walks and ghyll scrambles. This activity is growing fast so getting the qualification now could see your career take off. We have a fast turnover of jobs on OutdoorJAC so take a look in our Watersports and Multi Activity sections for coasteering vacancies. And sign up for our newsletter to keep up to date with new vacancies.